A man wielding a knife was arrested in north Lurgan by police last night. 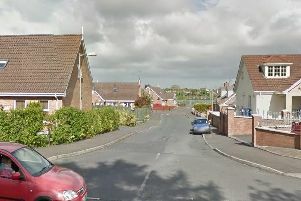 Residents in Kilwilkie reported seeing the man brandishing a knife in the estate yesterday evening. And the public was commended by the PSNI for their help in tracking the man down. Several police crews were tasked and the man was apprehended in the Forest Glade area. The PSNI Craigavon Facebook page stated: “We had reports earlier this evening of a guy walking about Kilwilkie armed with a knife. “We had several crews on the ground in a short space of time and, with the help of the local community, tracked our suspect down to Forest Glade where he was arrested a short time later. “We don’t take the mention of knives lightly, and took all precautions necessary to protect the local community and ourselves. “If you witnessed the incident, or have heard anything about it, please call 101. We need to speak to you. The incident number is 937 29/5/17. “Knife crime is not on. “Stats would show that you increase your own chances of getting stabbed by bringing a knife onto the street too. “You also dramatically increase your chances of seeing our less calm and friendly side. “Don’t even think about taking a knife into public as a weapon,” said the PSNI post.